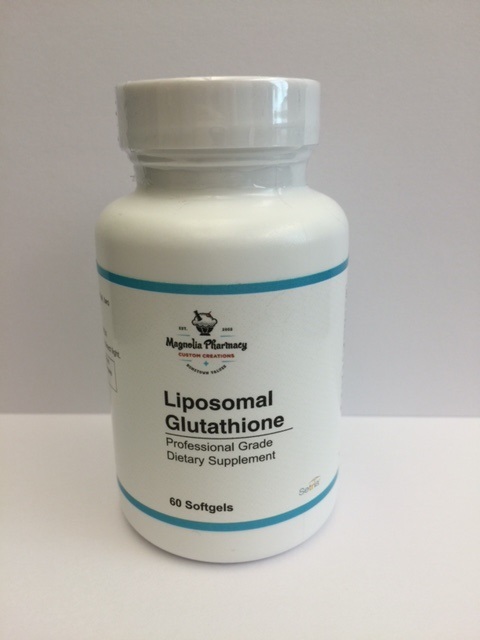 Liposomal Glutathione provides powerful antioxidant and cellular function support in an enhanced absorption form. FUNCTIONS Glutathione (GSH), is recognized as the most important antioxidant produced in the human body. It is a tripeptide thiol consisting of glutamic acid, glycine, and cysteine. Glutathione is present in every cell of the body, and the depletion of glutathione is noted in a wide range of medical conditions. Low concentrations of glutathione have been noted in individuals with asthma, viral infections, psoriasis, disease of the eye, Parkinson’s disease and Multiple Sclerosis. The sulfhydryl group of the cysteine is the active portion of the molecule. When glutathione is administered orally, it is broken down into the three amino acids in the blood stream by peptidases in the blood. The circulating amino acids are then reabsorbed into the cell and re-assembled to produce cellular glutathione. The reduced form of glutathione is the bioactive form. Glutathione has many functions in the body. Glutathione acts as the primary cellular detoxifier, helping to protect the cell from toxic exposures such as petrochemicals, pesticides, fungicides and the toxins in the air that we breathe. Glutathione helps to detoxify many of the prescription medications and other chemicals that we ingest. It can act as a heavy metal chelator, helping to protect us from toxic metals such as mercury, antimony, arsenic, lead and cadmium. Glutathione is particularly known for its ability to recycle other antioxidants such as Vitamin C and Vitamin E. Though its antioxidant activity, Glutathione helps to protect our mitochondria from damage or breakdown. Glutathione also helps to protect the cells of our nervous system from damage, and has been shown to be helpful in the improvement of neurological conditions such as Parkinson’s disease, Multiple Sclerosis, ALS, and Alzheimer’s disease. Certain organs of the body such as the eyes, skin, kidneys, spleen and liver contain high concentrations of glutathione. Given the increasing toxicity of our environment and the value of glutathione as an intracellular detoxifying agent, usage of glutathione has seen a dramatic increase. The purified phosphatidylcholine delivery system used in this product helps to protect glutathione bonds from the degradation that can occur in digestion. Also the liposomal delivery system offers enhanced absorption due to the hydrophobic and hydrophilic nature of the phospholipids. Optimal levels of glutathione have been associated with enhanced physical and mental health. Liposomal Glutathione may be a useful nutritional adjunct for individuals who wish to increase their levels of the essential antioxidant, glutathione. Other ingredients: Titanium dioxide, olive oil, beeswax, gelatin, purified water, and BioGluteTM Complex (proprietary blend of glutathione and essential phospholipids). This product contains NO hydroxylated lecithin. Adults take one (1) capsule twice daily or as directed by a healthcare professional. Warning: Pregnant women and children under the age of 12 consult healthcare professional before use. STORAGE Store in a cool, dry place, away from direct sunlight. Keep out of reach of children.